4. Even Buxton gets twice as many as us! NZ is one of the least thunder-prone places on earth. I'll bet even Iceland gets more. It's not only the number of thunderstorms you get, it's the intensity that matters. A couple of cracks of thunder and a shot of intra-cloud lightning barely qualify as a thunderstorm.. In my view anyways. Well by your definition we've only had 3 actual thunderstorms then but "thunderstorm day" is technically any day when thunder is heard at least once in the 24 hours period (9 so far this year, about average). The best thunderstorm we had this year was in January on 31st. 15 days a year on average here where thunder is heard. A slight majority of these occur in winter and barely last for more than a few claps. Summer storms can be large on occasion, but the lack of much rain/instability at that time of year make them few and far between. Usually the best storms occur inland, if you're going storm chasing in the summer here travelling north and east is the best bet 90% of the time as afternoon seabreezes kill the chance of storms developing during the afternoon near the coast. I think number of thunderstorms/ year is the more commom measurement here, though. In Buenos Aires Central Station is 54 (2001-2010). Near the river the number increases near 60. 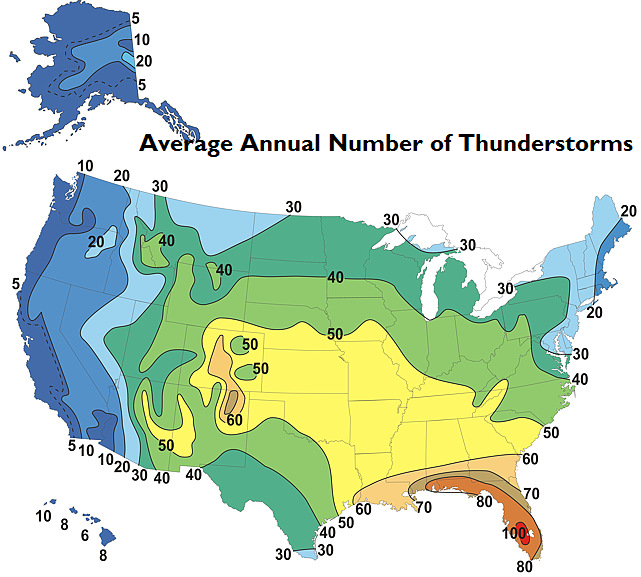 Average ocurrence of thunderstorms per month. Puerto Iguazú is on the northeast corner of the country, close to the Iguazu Falls (by the "Triple Border" Argentina-Brazil-Paraguay). Nice. Maine seems to get a relatively decent amount, while having cooler summers and cold, snowy winters. I'd love to live there. Much of VT/NH/upstate NY too. Seems like NE of Tampa/St Petersburg is the place to be though for thunderstorms. Somewhere between 10-20 for here. Maine? It has less thunderstorms than almost anywhere east of the Rockies. It's not too different from the UK. New England isn't that high, either compared to the Midwest.